I love plants, but have no where to put them in my home. The way my layout is, I don't have space in front of a window that is available. 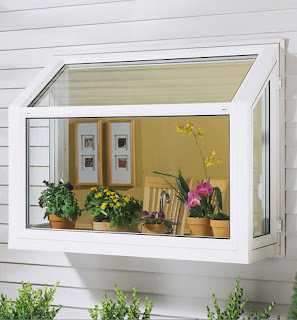 I dreamed about installing a garden window like this one in my kitchen, but that was too expensive. I kept a small plant teetering on my small kitchen window ledge, but I could never close the curtains at night. One day as I was looking at the BH&G magazine I found my solution! They had taken an IKEA kitchen rack and placed it in the window. It doubled as a curtain rod and plant stand. I went to IKEA and found this kitchen shelf, but it was too big or too small for my window. I bought the bigger one for $26.99 and my DH used a hack saw to make it smaller for me. I also bought some curtain clips for a couple of dollars. I sewed up some material (In the magazine they just used kitchen towels to hang). The shelf also doubles as a curtain rod and I hung my curtains on the back rod of the shelf. I went for a couple of months with only 1 little plant on the shelf until I found a bunch on clearance at Lowes this week. Now I get to enjoy my plants and I can easily open and close the curtains! Also, when I water my plants, if I spill the water just falls into the kitchen sink. I wish that I would have thought to take a before picture, but I did this before I had my blog. Just picture a regular kitchen window with blinds. That is so cute! I love the idea! I do like what you've done. 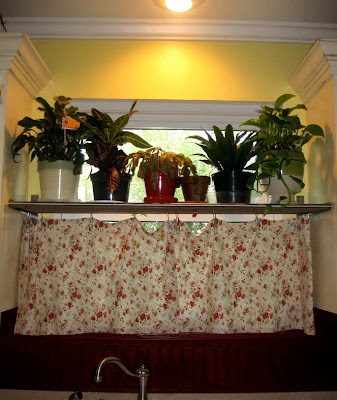 Plants in the window are a great way to have privacy but still let the light come in. Super cute! I love that idea! I love that! Great idea! Love this! We are looking into buying an foreclosure house this summer and I know I will need clever ideas to make it a home. Great idea. I'd try it too except I don't have a kitchen window. Yours turned out fab!